NEW YORK (Reuters) - A gauge of stocks around the world reached its highest point in about two months on Monday amid hopes for improving trade relations between the United States and China, while oil prices climbed further. Wall Street's main stock indexes registered slim gains, pulling back from stronger increases during the session. MSCI's index of stocks across the globe <.MIWD00000PUS> gained 0.12 percent, hitting a roughly two-month high during the session. Growing trade tensions have worried investors, with concerns about a global trade war feeding into increased volatility in the stock market in recent months. "It seems like there's a little less concern about a trade war with China given some of the overtures that President Trump made," said Chuck Carlson, chief executive officer at Horizon Investment Services in Hammond, Indiana. "They're hoping for a dying down of the trade war rhetoric and, quite frankly, they're probably looking for some successful deals (to be) made." The Dow Jones Industrial Average (.DJI) rose 68.24 points, or 0.27 percent, to 24,899.41, the S&P 500 (.SPX) gained 2.41 points, or 0.09 percent, to 2,730.13 and the Nasdaq Composite (.IXIC) added 8.43 points, or 0.11 percent, to 7,411.32. Energy shares (.SPNY) were the top-performing major group, helped by oil price gains, while defensive sectors such as real estate (.SPLRCR) and utilities (.SPLRCU) lagged. 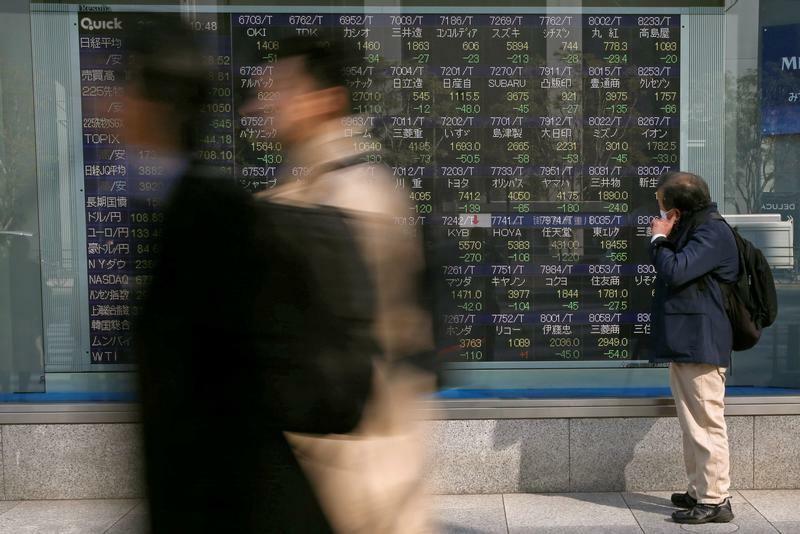 In Asia, Shanghai's SSE Composite index (.SSEC) rose 0.3 percent, Hong Kong's Hang Seng index (.HSI) climbed 1.4 percent, and Japan's Nikkei (.N225) rose 0.5 percent. Investors also pointed to improving sentiment about geopolitical tensions involving North Korea. U.S. Secretary of State Mike Pompeo said on Sunday that Washington would agree to lift sanctions on North Korea if the country agrees to dismantle its nuclear weapons program, a move that would create economic prosperity that "will rival" that of South Korea. The pan-European FTSEurofirst 300 index (.FTEU3) lost 0.04 percent. Oil prices rose as OPEC reported that the global oil glut has been virtually eliminated, while U.S. crude's discount to global benchmark Brent widened to its deepest in nearly five months. U.S. crude (CLcv1) settled up 0.37 percent to $70.96 per barrel and Brent (LCOcv1) settled up 1.44 percent at $78.23. The report from the Organization of the Petroleum Exporting Countries "was bullish. That absolute plunge in Venezuelan production ... just highlights how tenuous the market is in terms of the supply and demand balance," said John Kilduff, a partner at Again Capital LLC. The dollar index (.DXY) rose 0.09 percent, with the euro (EUR=) down 0.05 percent to $1.1936. Benchmark 10-year U.S. Treasury notes last fell 7/32 in price to yield 2.9969 percent, from 2.971 percent late on Friday.